I guess I forgot to mention on Monday that this and next week’s outfit photos are from my San Diego trip last week! It was quite a bit chillier than what I’m used to in August in Texas (a relief, I tell you!). One purchase I was eager to wear on one of the cooler nights was this Joie sweater. 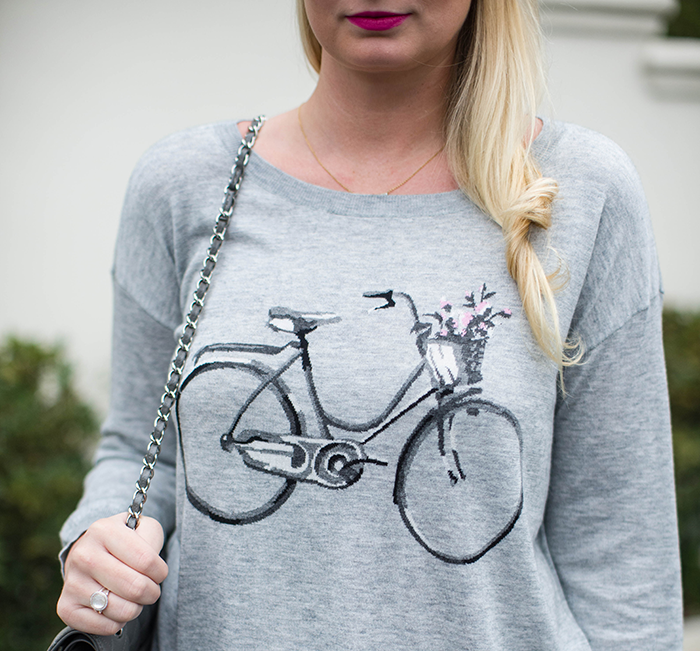 How cute is the little bicycle + flower basket? I think I bought it because I subconsciously really want a bike, but know I’ll never use it. It’s a pretty lightweight sweater which is going to be perfect for the next couple months in D-town before the temps drop to require more layering. It’ll also work come spring with cute skirts and shorts. Another recent purchase I’m crazy about are these leather-paneled J Brand jeans. They’re a classic fit with an edgy twist – perfect for day-to-night wear. Casual or dressed-up, they look amazing! I am so tempted to get these jeans, they look amazing on you. 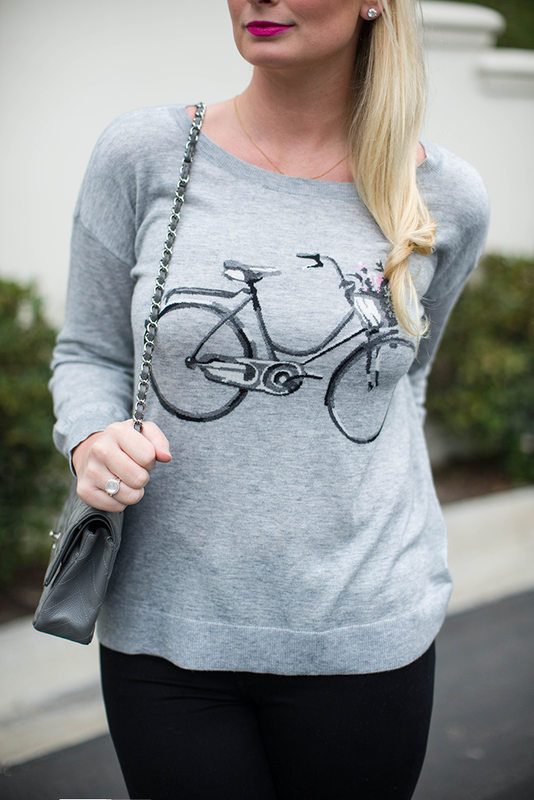 Such a cute printed sweater and that Chanel… gorgeous! Ahhhh! Cutest sweater ever!! I am craving intarsia sweaters for Fall, C. Wonder has some great ones also! This sweater is SO cute – love how you’ve dressed it up a bit here too! 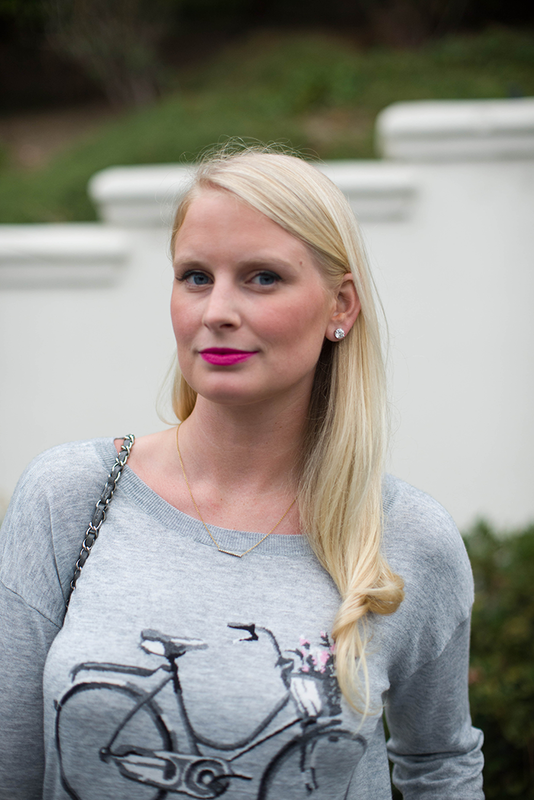 schiap is my all time favorite colored lipstick– wear it all the time! i am officially obsessed with these pants and need them in my closet for fall. LOVE it! I had been eying that sweater but never pulled the trigger. Looks great on you. 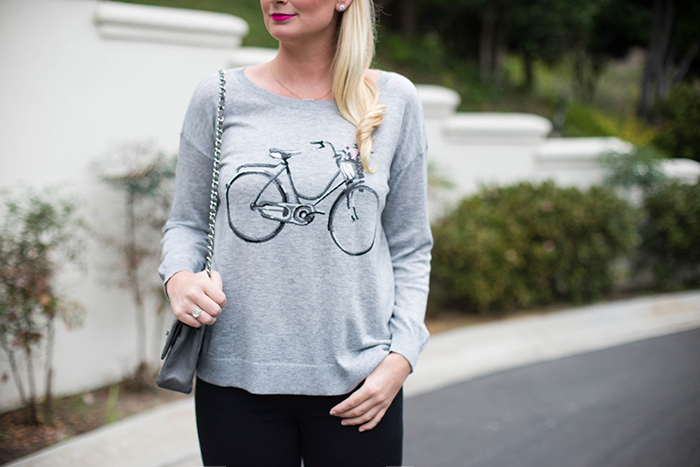 Cute sweater, very lightweight, and the biker style leggings go perfect with the metallic heels. Those jeans are fabulous! I love the leather details! The jeans are really cool. Sober and elegant pallet of colors. That sweater is too cute! I feel the exact same way about the bike…love it in theory…would use it as a bag rack in person. That sweater is adorable! And of course, those jeans — anything with a bit of leather is a win in my book! The two paired together is a perfect mix.